last weekend i was invited to a friend’s summer house in upstate New York. on Saturday morning, we made our way to a local farmer’s market and i saw gorgeous fruit and vegetable… i inhaled the most fragrant basil i’ve ever smelled… i could not resist to get creative. this salad, or dessert — depending on when you want to consume this dish, could not be any simpler to make. it’s so refreshing and full of flavor, precisely the dish that make you long for summer and its bounty. the trick is to use fresh produce, preferable just-picked fruits. farmer’s market is your best bet to get these produce, because chances are, supermarket’s produce were picked way before their peak time then traveled a long way to their final destination — hence, the watery and flavorless peaches or apricots. 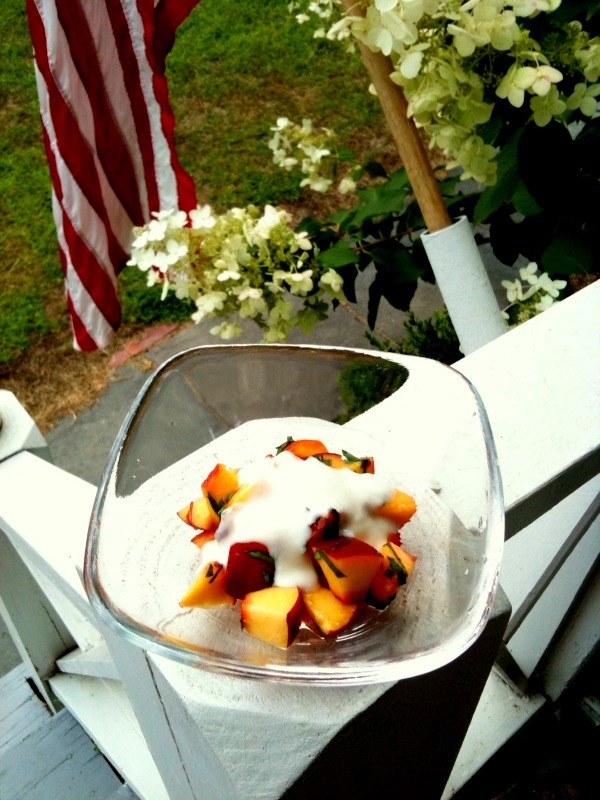 combine peaches, lemon juice, sugar, and basil in a mixing bowl, gently mix the ingredients. chill in the refrigerator for at least 30 minutes. when you are ready to serve it, top it with yogurt. serves 4 (or in my case, it serves 2…).